Broccoli is a hardy vegetable of the cabbage family which comes in a variety of colors, ranging from deep sage all the way to dark green and purplish-green. It is virtually fat free, low in sodium, and high in vitamins C and A. Broccoli is also high dietary fiber and iron and is highly recognized for its anti-cancer nutrients. 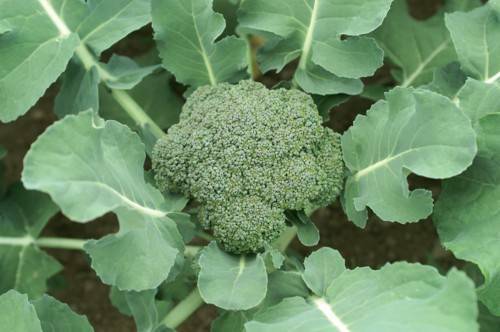 Other vegetables related to broccoli are broccolini, a mix between broccoli and gai-lin (Chinese broccoli), and broccoflower, a cross between broccoli and cauliflower. Broccoli sprouts have also recently become popular as a result of research uncovering their high concentration of the anti-cancer phytonutrient, sulforaphane. Consume fresh broccoli as soon as you can as it will not keep long. To store, mist the unwashed heads, wrap loosely in damp paper towels, and refrigerate. Use within 2 to 3 days. Do not store broccoli in a sealed container or plastic bag. Raw broccoli requires air circulation. Another storage suggestion, though uncommon, is to submerge the stem portions of an entire bunch of broccoli into a wide-mouthed pitcher filled with ice water. Cover the broccoli crowns loosely with a plastic bag, and change the ice water daily. This unique method will keep the bunch fresh and crisp for a whole week. Never wash broccoli before storing in the refrigerator. The excess moisture promotes mold. To freeze: Cut washed broccoli into florets and stalks into pieces. Steam or blanch about five minutes. Plunge into ice water to stop cooking, drain thoroughly, and place in sealed bags or containers. Freeze up to 12 months. Do not wash broccoli until just before you prepare it. Trim the tough portion of the stem about one inch from the bottom. How you cut the broccoli prior to cooking is a matter of preference and the nature of the dish you are planning. For salads and stir-fries, cut the broccoli into bite size pieces. Include the stems, too. Many cookbooks will direct you to discard the leaves and peel the stems, but many nutrients and fiber will be lost. Keep the stems intact, and simply chop them or cut them into julienne strips to take advantage of their valuable vitamins and minerals. Broccoli is best when quickly steamed or stir-fried. About 7 minutes is optimum steaming time for broccoli. Remove the lid several times during steaming to release steam which helps the broccoli retain its bright green color. Overcooking enhances its strong flavor and aroma, dulls the color, and leaches out nutrients. It should be cooked a minimum amount of time until tender, but still crisp. If you plan on using the stalks and florets in the same dish, begin cooking the stalks 1 to 2 minutes before adding the florets as the stalks take longer to cook. Broccoli can also be eaten raw. The raw florets can be a nutritious snack. Try them with a low-fat dip, or include them in your favorite salad. If you're cooking broccoli, make sure to support your nourishment by sticking with a low cooking temperature in a range that includes the steaming temperature of 212°F (100°C), with a cooking times of 5 minutes at the most. Since the fibrous stems take longer to cook, they can be prepared separately for a few minutes before adding the florets. For quicker cooking, make lengthwise slits in the stems. While people do not generally eat the leaves, they are perfectly edible and contain concentrated amounts of nutrients. We recommend Healthy Steaming broccoli for maximum nutrition and flavor. Fill the bottom of a steamer pot with 2 inches of water. While waiting for the water to come to a rapid boil prepare broccoli florets and stems. Steam stems for 2 minutes before adding the florets and leaves. Steam for 5 more minutes. Toss with our Mediterranean Dressing and top with your favorite optional ingredients.. For details see, 5-Minute Broccoli with Feta Cheese and Kalamata Olives. The principle of a 212°F (100°C) or lower cooking temperature leaves you with several cooking options for your broccoli. Our cooking method of choice for this cruciferous vegetable is steaming. We've seen studies on flavonoids in broccoli, B complex vitamins in broccoli, vitamin C in broccoli, as well as carotenoids and chlorophyll and glucosinolates in broccoli, and in all cases, steaming has been shown to do a better job of preserving nutrients than other cooking methods. You'll find some websites encouraging you to microwave your vegetables, including broccoli. We don't believe that this recommendation is supported by the research. But in addition, we believe that it's important for you to understand why. Many nutrients can be lost from food when the food surface comes into direct contact with water. Hotter water temperatures leech more nutrients from food, as will longer cooking times. Most research on microwaved broccoli has involved the placement of broccoli in a microwave container that has been partially or completely filled with water. That practice means direct water contact with all or part of the broccoli surfaces. Steaming, by comparison, leaves the broccoli in contact with steam only and can reduce nutrient loss for this reason. It's possible to steam broccoli in a microwave, but since metal containers (like stainless steel) cannot be used in a microwave oven, plastic microwave steamers are the only widely available option here, and we generally try to avoid the heating of foods in plastic in the microwave due to risk of plastic migration into the food. All of the factors described above makes it difficult to microwave broccoli with as little direct water contact or as shortened cooking times as steaming. We also like the more uniform exposure to heat that occurs with steaming. In general, we try to avoid the stir-frying of foods in oil due to risk of nutrient damage in the oil from high heat. That being said, we have seen a study of broccoli stir-frying that produced some fairly encouraging results with respect to nutrient retention in the broccoli. (The study did not measure nutrient damage in the oil.) The stir-frying took place for 3-1/2 minutes in a frying pan heated to 248°-284°F (120°-140°C). Approximately two-thirds or more of the nutrients examined (including vitamins, minerals, phenols, and glucosinolates) were retained after stir-frying. Given these results, if you are planning to stir-fry your broccoli, we'd recommend a lower-heat skillet (at approximately 250°F/121°C) and a relatively short stir-frying time of about 3 minutes or less. Toss pasta with olive oil, pine nuts and steamed broccoli florets. Add salt and pepper to taste. Add broccoli florets and chopped stalks to omelets. The following nutrition information is for one medium stalk (148 grams) of broccoli. Broccoli is an excellent source of vitamin K, vitamin C, chromium, and folate. It is a very good source of dietary fiber, pantothenic acid, vitamin B6, vitamin E, manganese, phosphorus, choline, vitamin B1, vitamin A (in the form of carotenoids), potassium, and copper. Broccoli is also a good source of vitamin B1, magnesium, omega-3 fatty acids, protein, zinc, calcium, iron, niacin, and selenium. Broccoli is also concentrated in phytonutrients. In one particular phytonutrient category—glucosinolates—broccoli is simply outstanding. The isothiocyanates (ITCs) made from broccoli's glucosinolates are the key to broccoli's cancer-preventive benefits.